Want fast, Powerful action for outdoor maintenance jobs? Here's the solid answer... Simplicity's all-new 2012. . . the most powerful unit ever built by Simplicity, the all-time leader in the manufacture of superior outdoor power equipment. Action? This versatile, compact unit is designed to minimize the chores that before seemed too big to handle. . . the spacious lawns of large estates, country clubs, nurseries, schools, farms. . . anywhere that power aplenty is needed four seasons of the year. The rugged 2012 lets you master man-size jobs. . . gliding along in cushion comfort . . . clinging to slopes and ridges . . . mowing up to 2 acres an hour. . . maneuvering around trees and shrubs. . . and finishing big jobs in a jiffy! Unlike many other makes on the market, Simplicity manufactures over 20 attachments designed, engineered and tested to fit the power unit. Backed by 25 years experience manufacturing outdoor maintenance power equipment, the tractor and attachments carry the Company's assurance of satisfaction. Prior to the 2012, putting a big power package into a compact tractor resulted in a great deal of vibration. . . and nothing shakes a tractor owner's confidence more than heavy vibration. The new 2012 puts those shaky days in the past, with a new Briggs & Stratton engine that cuts vibration drastically. This engineering feat was achieved through a system of synchronized balancers which reduce engine vibration. This cuts to a minimum the vibration transmitted through the steering wheel, seat and foot rests, and results in smooth, even engine performance. . . reduced operator fatigue. . . greater comfort and efficiency. How does the engine combat vibration? 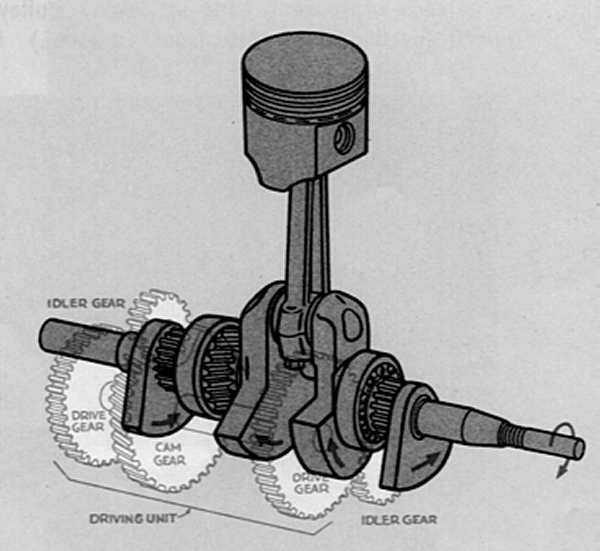 Counterweights at each end of the crankshaft are geared to rotate in a direction opposite from the crankshaft weights. 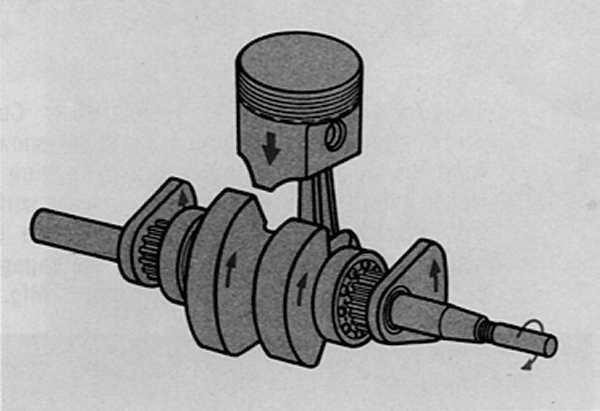 Thus the counterweights balance the crankshaft weights in a horizontal position (sketch A) and in the vertical position combine with the crankshaft weights to balance the weight of the piston (sketch B). The designers of this engine put durability foremost. Precision ball bearings at both ends of the crankshaft withstand severe loads under any conditions . . . chrome-plated piston rings assure maximum ring and engine life. . . Stellite-faced exhaust valve and stellite seat, plus positive-type rotator, result in more than double normal valve life. . . Dual-spring governor regulates idle and all running speeds, and immediately adjusts for heavy loads. . . Rotating screen on starter hub seals out twigs, grass and debris. Put a versatile new 2012 in your life, and live the life of Simplicity 12 months of the year!